This men's hunting jacket keeps you warm in the field while giving your arms the range of motion you need when climbing trees or shooting fowl. It's made with Quick Duck canvas that's lighter than traditional sandstone duck, but ounce-for-ounce just as tough. This rugged layer keeps you dry in light rain. It includes a front-loading game bag, shell storage pockets, and two water bottle pockets. Quick Duck® is our lightest durable canvas fabric. It is 30% lighter than traditional sandstone, but ounce for ounce as durable. Quick Duck® canvas is 30% lighter than traditional sandstone duck, but just as durable. Even better, Quick Duck® now comes with 3M™ Thinsulate™ insulation for warmth without the weight. It’s also built with Rain Defender® durable water repellent so moisture beads up and rolls off. Your workload isn't getting any lighter, so your gear better be. 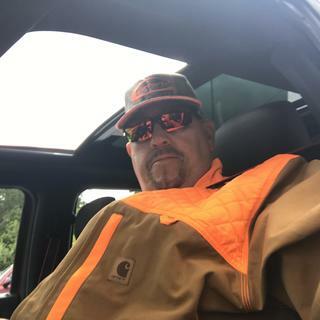 It fits and feels great, but I haven't been able to get it out in the field yet, so I won't rate the quality/durability yet, but if it's anything like all my other Carhartt gear, then I'm sure it'll be great! I got this jacket as a gift and it has been the best Pheasant hunting coats I've ever owned. It is light weight and very durable. I didn't have to layer up to much under it either on the cold days. Package was delivered promptly and on the day it was supposed to be delivered. Great job. Fits good. Plenty of arm length. Good freedom of movement. Wore it out on s couple hunts do far and it seems to be holding up good so far. This my second year hunting with this jacket and I like everything about it except it's breathability. The material lining the game pouch does not breath and it extends over halfway up the jacket back. So after a couple hour hunt through some tough cover my back gets wet from perspiration. Thank you for your feedback. Please contact us at 1 800 833 3118 if we can provide you with any assistance. Nice jacket. Sizing chart had me XL but that was way too large, size Large fits fine with room for additional underneath. Would be nice to have a soft collar liner. I wore this jacket everyday for 7 days hunting birds in Kansas. It held up great! I walked through a lot of nasty stuff and it turned back thorns and briars. Order your normal jacket size. Great weight. Not too light or too heavy. I was warm on the cold, windy days but not too hot on the warmer days. Plenty of room in the jacket to layer heavy shirts and thermals. Great range of motion for shooting. Very impressed with Carhartt's upland clothing so far. This is a great jacket, I’ve used it on days that were 5 F outside and up to 50 F. It does run just slightly large but that allows space for layers on cold days. I got a medium I’m 6’ 160lbs. I would definitely recommend this field jacket to any upland hunter. Quite happy with it. Unfortunately it wasn't made in the USA. I would have been willing to pay more if it had been made by Americans. Was concerns about length when I pulled this off the rack to try on. No need to be. Generous length in both sleeves and torso. Covers all that I have abused over the years and looks smart IMO. The "old" jacket part number 102231 has "Carstron" nylon orange shoulder overlays. On the new jacket part number 102800 it has been changed to 100% polyester. Which is more durable for going through the thick thorns? I'm not sure most of the thorns I walk through are below the belt. BEST ANSWER: The medium size of this jacket has 296 Sq In of orange, the large has SLIGHTLY more but still not close to 400. My state requires 400 square inches of blaze orange. Do you know how many square inches of blaze orange this jacket has? Thank you. What is the diff between upland field coat 102231 and 102800? BEST ANSWER: I have the 102800 field jacket myself. I could not find the 102231 reference number you are asking about so I cannot add/offer any insight to your question. Did you get the product number right? I’m looking for a cb950 style quilted hunting jacket in a xl 48 do you make them anymore or something compatible ? BEST ANSWER: Unfortunately, cb950 is not recognized as a style number. Please feel free to contact us for assistance. Are there any plans to make a full line of tall sizes in the new upland field jacket? 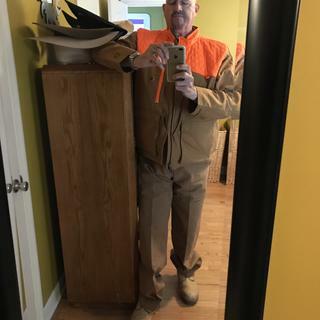 Tried it on today- and it fits just like all the other Carhartts I own- Large is to short and XL is too baggy. I need a Large Tall!! BEST ANSWER: Not in the near future, but we'll be glad to share your input with Product Design.